Ken Ham's best arguments (Cont'd). The organization of the debate. "All these dating methods actually give all sorts of different dates, even different dating methods on the same rock. ... Actually, 90 percent of them contradict [by] millions of years." He also describe a piece of wood whose estimated age is 45,000 years being found in a piece of rock dated as 45 million years old. This is not a good example to use, because the wood would have been analyzed using a carbon dating process -- a measuring technique that is only meaningful back to about 45,000 years. That is, carbon dating cannot differentiate between a piece of wood that is 45,000 years of age of 1 million or more years of age. "There isn't enough time since Mr. Ham's flood for this limestone to come into existence." 4. Development of the full diversity of modern animal species from a limited number of animal "kinds:"
Ham promoted the concept of a "Creation Orchard" in which God created a limited number of "kinds" of animals and plants, each of which produced other, similar species over time. For example, one kind of animal was a wolf-like species from which all of today's wolf species, dogs and similar animals developed. Only two or seven examples of each "kind" rode on Noah's ark. After the ark landed, these kinds developed into the diversity of species that we see today. 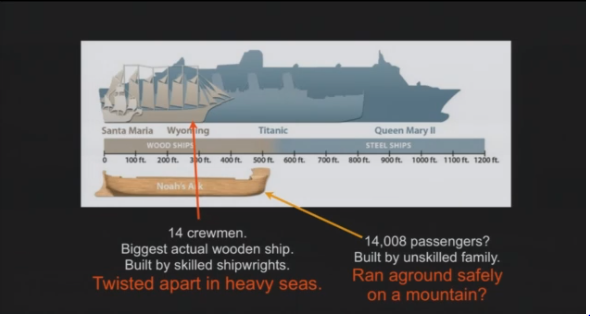 with the world's largest wooden ship, the Titanic and Queen Mary II. "If you believe in millions of years, you've got death and suffering and disease over millions of years. ... The Bible makes it very clear death is the result of man's sin." Ham is referring to the concept that there was no sin or death in the original creation. Only when Adam and Eve disobeyed God's instructions, ate the fruit from a magical tree, and learned the difference between good and evil did sin and death commence. God then transferred Adam and Eve's sin onto their innocent children, grand children, great grand children, and all the approximaely 160 to 400 generations up until the present time. "... no incompatibility between religion and science. There are millions in the world who believe in God and accept science." The earth and the rest of the solar system is about 4.5 billion years old. The first living cell came into existence due to natural processes and chance events. The great diversity of plants and animal species evolved from that original cell, over the last 3.6 billion years to become the great diversity of species that we see on earth today, including bacteria, grass, trees, dogs and cats, whales, sharks, etc. Nye obviously had an excellent understanding of all aspects of evolution, and the ability to communicate these ideas well to the public. He task was made easier by the fact that there really is only one "theory of evolution" that is accepted as fact by essentially all biologists, geologists, cosmologists and most other scientists. The Earth and the rest of the universe were created by God in six days less than 10,000 years ago. Creation of the stars, solar system, Earth, and many "kinds" of animals happened over a six day interval circa 4004 BCE. The "kinds" of animals later became Individual species of animals. For example, one kind consisted of a large four legged animal, similar to a horse. Adam and Eve disobeyed God, ate the fruit of the tree of knowledge of good and evilm and thus committed the original sin. This sin has propagated down through the generations to the present day so that all persons alive today are destined to spend eternity in Hell unless they are saved by accepting Yeshua of Nazareth (Jesus Christ) as Lord and Savior. Noah built an ark so that he, seven other members of his family, and 2 or 7 members of each "kind" of plant and animal could survive the world-wide flood which covered the earth to submerge even the tallest mountains in water. The flood subsided, about 1,300 years after the original seven days of creation. Each kind gradually underwent "genetic alterations" which is sometimes referred to as micro-evolution. A single kind became become multiple similar species today. For example, the descendents of the large four-legged animal referred to above became horses, donkeys, zebras, etc. A similar kind that was smaller became wolves, dingoes, coyotes, and dogs, etc. Creationism is a broad term encompassing many different belief systems, all derived from different interpretations of the biblical text. However, Ham's job was simplified because he only explained his own particular variation of young earth creationism.